Kennedy at the 2012 Comic-Con in San Diego. 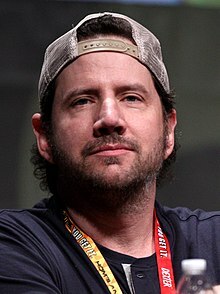 James Harvey "Jamie" Kennedy (born May 25, 1970) is an American stand-up comedian, television producer, screenwriter and actor. He was born in Upper Darby, Pennsylvania. He came to prominence in the late 1990s for playing Randy Meeks in the Scream movie series. Kennedy formed a production company called Wannabe Producers, alongside Josh Etting, through which he has produced the shows The Jamie Kennedy Experiment, Blowin' Up, The Starlet, and Living with Fran. Following Malibu's Most Wanted, in which he both wrote and acted, Kennedy co-wrote the MTV show Blowin' Up (2006) featuring his friend Stu Stone. In 2008, Kennedy released the documentary Heckler, about the plight of stand-up comics versus their often-aggressive audiences. 1994 VR Troopers Elmo Episode: "Cybertron"
1997 Perversions of Science Spaceman John Episode: "Panic"
2000 Stark Raving Mad Doobs Episode: "My Bodyguard"
2001 Strange Frequency Pete Derek Episode: "A Change Will Do You Good"
2002 Night Visions Mark Stevens episode: "Cargo"
2003 King of the Hill Dr. Tim Rast (voice) Episode: "Queasy Rider"
2004 King of the Hill Fudgie / Police Chief (voice) Episode: "Phish and Wildlife"
2004 Crank Yankers Wally Palumbo (voice) Episode: "2.23"
2005 Living with Fran TV Announcer Episode: "Who's the Parent?" 2006 Mind of Mencia Will Pillowbiter Episode: "Stereotype Olympics"
2007 Living With Fran Alan Episode: "School Ties"
2008 Reaper Ryan Milner Episode: "Hungry for Fame"
2010 Supreme Court of Comedy Himself Episode: "Kevin Nealon vs. Jamie Kennedy"
2010 Eureka Dr. Ramsey Episode: "The Story of O2"
2014 Kingdom Bucky Episode: "Eat Your Own Cooking"
2015 Star vs. the Forces of Evil Helios (voice) Episode: "Royal Pain"
2017 Lucifer Andy Kleinburg Episode: "Stewardess Interruptus"
This page was last changed on 13 August 2018, at 04:08.